IN April 1908, Manavasi Ramaswami Iyer, a supervisor in the PWD at Tiruvannamalai visited the Maharshi at the Virupaksha cave. A friend who accompanied him felt that the visit was a waste. But Ramaswami Iyer desired to have Maharshi's darshan again. So, he visited the Maharshi again all by himself. The Maharshi was at that moment quite alone. For some unaccounted reason there was an emotional upsurge in Iyer on seeing the Maharshi and he asked him, "Swami, great souls like Jesus arose on the earth to redeem sinners. Is there no hope for me?" The Swami was moved and rising from his seat said in English, "Yes there is hope, there is hope, there is hope." Iyer noted this in his diary, a habit he had cultivated since then. Iyer not only came from a family with a tradition of music, he himself was a composer. On the very day of this visit he composed a song which means: "You are my refuge. I have none else to turn to. You are a sweet and fragrant bouquet of flowers charming to the bees of the devotees swarming at your feet." Subsequently he composed several songs among which the one with the refrain, "In you I take refuge" (Saranagati song) is extremely beautiful and moving. Subsequently, Iyer visited the Maharshi in the evenings whenever possible. On one occasion, the Maharshi sat absorbed in silence for half an hour and later looked at Iyer. The latter at once felt a hot current flow into him. He had a similar experience on another occasion also. Iyer suffered from indigestion and sleeplessness. Because of these problems he felt uneasy in his head and could not sleep one night. The Maharshi asked him what the matter was. Soon thereafter Iyer felt normal in the head and could sleep soundly. It was the eighteenth day of the Tamil month, Adi of the year, Sowmya. A lady devotee brought delicacies specially prepared for the occasion for the Maharshi and his devotees. Owing to his dyspepsia Iyer could not partake of anything other than thin gruel. But at the Maharshi's insistence on that occasion he partook of good, rich food. Strangely, it had no effect on him and he also slept soundly. Thus he began experiencing the grace of the Maharshi even in minor physical matters and came to rely on him without any care. 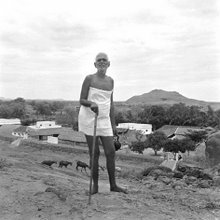 The family members of Iyer at first demurred at his going and staying with the Maharshi but after learning that his indigestion got miraculously cured they no longer objected and began sending his food to the hill. Ailments which did not yield to expensive medication vanished at the mere look of the Maharshi. This diksha by sight of the Maharshi was more potent than that by touch. "Whenever I am forgetful of the Self I become low and beastly. When I am conscious of "I am" there is no more bad nature. How happy I feel when once I enquire "Who am I? ?" and come by another stream to the brain! The very act of questioning involves using the will. The greater the will power, the greater is the happiness. The reverse also is true. I have no doubt about this." The substance is this: the Sakti of the atma is superior to all and through the method of enquiry it can be strengthened. With that, not only the sufferings of the soul but even those of the body can be eliminated. The Maharshi always abided in the Self. In his very presence every infirmity vanished!